Whirlpool Golf Course is one of Canada’s most highly rated and renowned public golf courses. 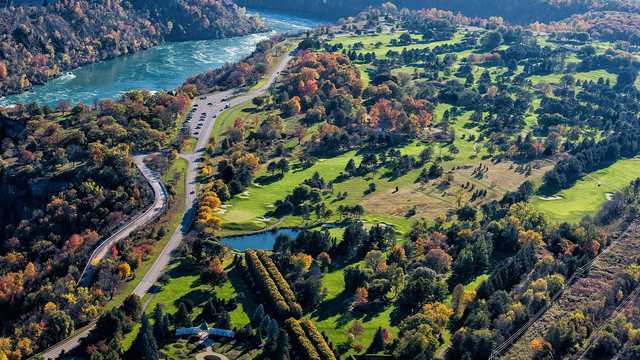 Owned and operated by the Niagara Parks Commission the course is located in a spectacular setting against the backdrop of the Niagara River Whirlpool and Gorge. Designed by the famous golf course architect Stanley Thompson (also know as the Toronto Terror), and the architect of many other highly acclaimed course designs including Banff Springs, Capilano, St. Georges, and The Highland Links in Cape Breton, NS along with countless over classic designs across North America, Whirlpool is a must play for all golfers. Opened on July 2, 1951, with an international tournament between four well-known professionals. Ten thousand spectators witnessed the defeat of the Canadians, Stan Leonard and Bob Gray by the American players, Dr. Cary Middlecoff and Jimmy Demaret. During the first year of operation, the course saw play by some eighteen thousand, two hundred and fifty-one persons and by mid-1980 the course had seen its one-millionth player.